The Rubicon Trail is one of the best-known and most technical rock crawling truck trails in the United States. That’s why Jeep’s most extreme off-road Wrangler is named after it. Well, I’m sure a few Jeeps were surprised to see a group of Chevy ZR2 pickups in their mirrors out there last year. The Colorado ZR2 is an earnest off-road variant of Chevy’s mid-sized pickup truck with about a two-inch lift over the regular truck on extremely advanced shock absorbers, 31-inch tires, heavy armoring below the engine and along the gunwales and rear and front locking differentials as standard equipment. As part of Chevy’s shakedown process, a group of engineers took a small fleet of these trucks through the Rubicon Trail. GM engineer Darren Bohne, who oversaw much of the ZR2’s development and was part of this trip, told me the team took three days to complete the 12-mile trail, which is pretty typical. “And we didn’t touch a tow strap,” he beamed. Heck, if you can’t make it to northern California to run the route yourself, you can actually “drive it” from the comfort of your computer with Google Street View thanks to Top Gear USA. For those of you who have been there, GM engineer Brent Deep told me that the ZR2s made it up Cadillac Hill in under 90 minutes. I haven’t seen that obstacle myself, but the GM folks were pretty pleased with themselves over that one. “I know this is going to sound like OEM B.S., but honestly, we were impressed at how little trouble we had out there,” Bohne said. 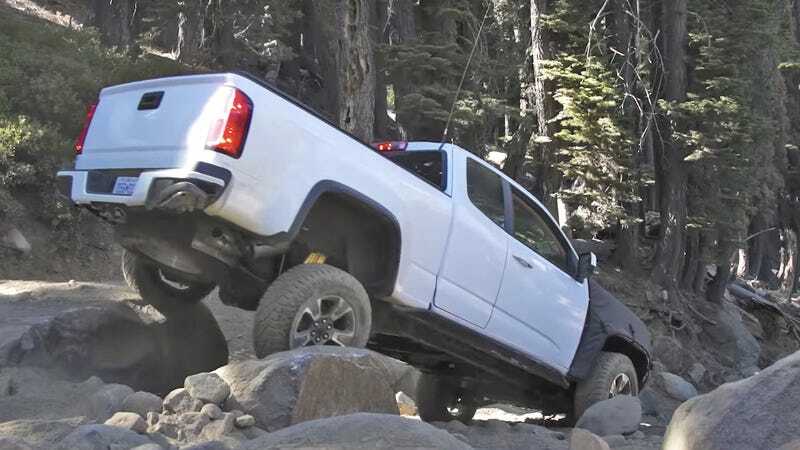 “There was some very minor body damage, and a front axle on one of the trucks did get dinged,” but apparently the only thing that really gave the ZR2’s development drivers a hard time was camping in the cold. “And my snoring,” Deep added. Incredibly, both GM guys I talked to indicated that their camo-clad pickup trucks didn’t attract all that much attention. “A few people asked if the trucks were stock, but nobody was all that interested in the development trucks on the trail,” I was shocked to learn. “We brought a spare transfer case, spare axles, recovery gear, and didn’t touch it,” I was told. Both gasoline and diesel versions of the truck reportedly ran well without overheating or exploding. And the Rubicon gets to something like 7,000 feet of elevation. The ZR2s that made the Rubicon trip were fitted only with factory equipment, including the standard Goodyear 31-inch tires, skid plates and rock sliders. Interestingly, the truck does not have armoring over the fuel tank but GM’s engineers insisted to me that it’s mounted high enough above the frame rails to be fine without specific protection. I’m looking forward to sharing my driving ZR2 impressions soon (Monday, May 15th to be exact) but I have to admit I’m really impressed to hear that a stock mid-sized pickup truck made it all the way through what might be the most notorious off-road route in America. What Do You Want To Know About The 2017 Chevy Colorado ZR2?